Mr Serafeimidis is a consultant general and laparoscopic surgeon who works at Withybush General Hospital in Pembrokeshire. He graduated from Athens Medical School, National and Kapodistrian University of Athens, Greece in 1998. He completed his higher surgical training in 2008 and after sitting his fellowship exams he was granted the title of specialist general surgeon. 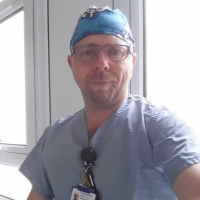 Since then he has worked in Greece, New Zealand, Fiji Islands and in 2016 was appointed as a substantive consultant in Withybush Hospital, Hywel Dda UHB. He is specialised in general and laparoscopic surgery and also has a special interest in diseases of the breast. He performs the bread and butter general surgery operations, such as laparoscopic cholecystectomies, all types of hernias, vasectomies under local or general anaesthesia, pilonidal sinus operations as well as skin and soft tissue operations. He works as a full time consultant at Withybush Hospital and he sees his private patients at BMI Werndale Hospital in Carmarthen.